Taking John Gray’s 1992 title “Men Are From Mars, Women Are From Venus” a little too literally, “The Space Between Us” concocts an elaborate science-fiction scenario on which to hang an otherwise clichéd tale of impossible teen romance. 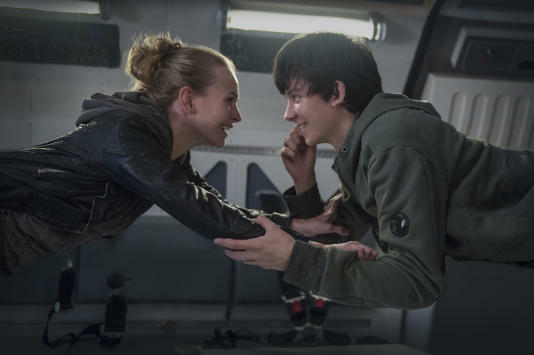 Here, the tiny detail that prevents 16-year-old Gardner Elliot (“Hugo” star Asa Butterfield) from dating high-school student Tulsa (Britt Robertson, of “Tomorrowland”) is the fact that Gardner has spent his entire life on the Red Planet — and if he travels to Earth, he may die. To some, that may sound like a compelling premise for a weepy romance — call it “The Fault in Our Planets,” if you like. In truth, it’s a ridiculously expensive spin on “The Boy in the Plastic Bubble,” where the mostly Mars-set first act adds millions of dollars to the budget but virtually no value to the story itself, a by-the numbers meller in which a freakishly tall kid with spindly bones and an enlarged heart risks his life in order to experience love and the kind of companionship he’s been denied since birth. Conceived on Earth by a father he’s never met, Gardner was the first human born on Mars (his mother died moments after holding her son for the first time). He’s been kept a secret ever since by an eccentric British space buff named Nathaniel Shepherd (Gary Oldman), who wrote a letter to the U.S. president when he was 12 explaining how “courage without limits” would lead men to colonize Mars. And now they have — courtesy of Nathaniel’s own company, Genesis Space Technologies.